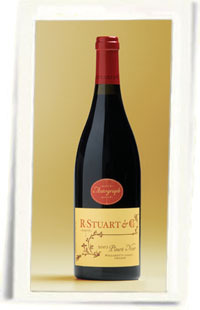 R. Stuart and Company generously contributed our first large-format bottle from Oregon, a 3.0L bottle of their “Autograph” Pinot Noir, retail value $140.00. “A blend this year of four of our very favorite vineyards: Weber, Winderlea, Temperance Hill and Daffodil Hill. The first two offer gorgeous Dundee Hills red fruit, floral elegance and exotic spice; th latter two from teh Eola hills bringing on blue notes, earthiness, structure.” R. Stuart & Co.
I’ll start it at $80. It’d be nice to know the vintage…. Thanks Seth. I fixed it.